An illustrated children’s book to read aloud, but more than that, a children’s book with the art work done with loving care. You can read a message in the story or not. But the visual exploration of hugging the entire world touches your heart again and again. It’s a story to read to little children at night, as a reminder that this world needs our hugs. There is definitely a beautiful message here about protecting the endangered species, and the endangered planet. But it’s offered in a simple way by just extending the theme of giving a hug to everything that this little kitten loves. To me, it’s an ideal way to offer a consciousness-raising idea to a young child without hammering at it. The illustrations are just lovely, as if you are touching the water-color art itself. The story is utterly simple, and overall this illustrated children’s book is a great addition to your night-time reading collection. Be sure to get the hard-cover version of this book, and not the boardbook. I think it’s important for an illustrated children’s book like this to be respected as a work of art, which boardbooks cannot do. I don’t know the quality of the paperback, but that’s also an option. 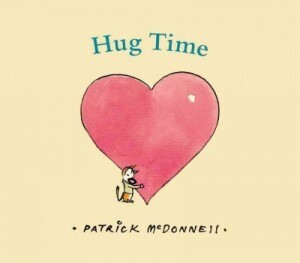 This little book is easily appropriate for children as young as 4, since it’s never too early to start giving out hugs!